The comet being studied by Europe's Rosetta spacecraft has massive sinkholes in its surface that are nearly wide enough to swallow Egypt's Great Pyramid of Giza, research published on Wednesday shows. Scientists suspect the pits formed when material on the comet's surface collapsed, similar to sinkholes on Earth, a study published in the journal Nature said. 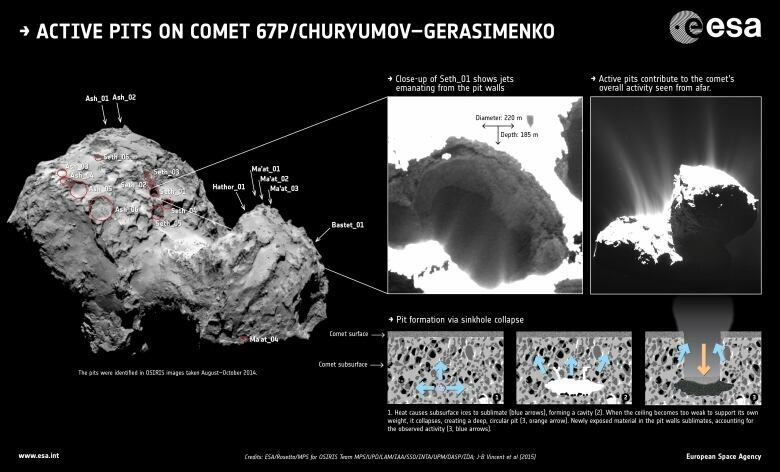 The cavities on comet 67P/Churyumov-Gerasimenko, which Rosetta has been orbiting since August, are enormous, stretching some 200 metres in diameter and 180 metres in depth. In comparison, the Great Pyramid is 230 metres across and currently 139 metres tall. The discovery is expected to help scientists piece together a better understanding of how comets formed and evolved. "Finding the pits was a total surprise," said space physicist Paul Weissman, with NASA's Jet Propulsion Laboratory in California. Comets like 67P are believed to be rubble piles of boulder-sized mini-comets made of rock, organics and ices. Gravity pins them together gently, with lots of open spaces in what eventually forms the comet's body. Why the pits begin collapsing is not yet known, but could be related to the heating a comet experiences as it travels closer to the sun. 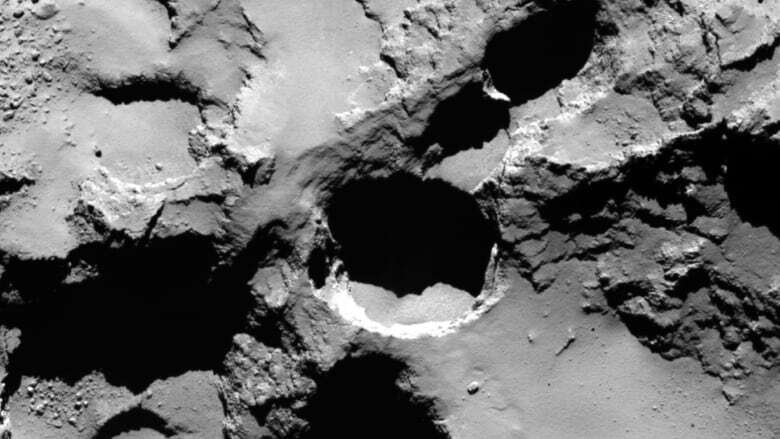 Several of 67P's sinkholes, for examples, are pumping out jets of dust. "We see jets arising from the fractured areas of the walls inside the pits. These fractures mean that volatiles trapped under the surface can be warmed more easily and subsequently escape into space," lead researcher Jean-Baptiste Vincent, with the Max Planck Institute for Solar System Research, said in a statement. Similar circular shapes have been found on the surface of other comets, but those pits were filled in by new material that had collected over the eons. Scientists suspect they are seeing freshly formed pits on 67P, which in August will reach its closest point to the sun in its 6.5-year orbit. None of the 18 pits found on the surface of 67P are located near where Europe's Philae lander settled in November. Scientists are attempting to re-establish a steady communications link between the newly revived Philae and Rosetta so the lander can resume science operations. The European Space Agency last week extended Rosetta's mission, which was due to end in December, to September 2016.